After losing her parents in a car accident and her sister to a house fire, Christy Reed has been mired in grief. Life is finally starting to feel normal again when an envelope arrives in the mail--addressed in her sister's handwriting. And the note inside claims she is still alive. FBI Special Agent Lance McGregor, a former Delta Force operator, is assigned to reopen the case, but he's coming up with more questions than answers. If Ginny Reed is still alive--who is the woman buried in her grave? Where is Ginny? And is Christy a pawn in a twisted cat-and-mouse game--or the target of a sinister plot? As he digs deeper, one thing becomes clear: whoever is behind the bizarre ruse has a deadly agenda. Bestselling author and two-time Christy Award finalist Irene Hannon warms readers' hearts as they root for a romance between Lance and Christy, but she pulls out all the stops as this high-stakes thriller chills to the bone in a race to the finish. This is an incredible romantic suspense novel! This is part of a “true” series. You should read the first book in the series before reading this one. Before I had even gotten halfway through the prologue my heart was pounding and I was hooked and knew that I would be finishing the book as quickly as I could. The writing style is very compelling and the characters are masterfully developed. This includes both those on the good side that need protection and those on the evil side. Christy Reed and Lance McGregor are dealing with loss from the past. They are processing things in very different manners but both are moving on with their lives. I was rooting for each of them as well as hoping to see a relationship develop between them from early on. They are definitely likeable characters. I was amazed at the detail that was put into developing the evil mastermind. It was incredible to see just how twisted someone’s mind can become by things that happen in their past. After the dramatic, attention grabbing prologue we jump in time and have a slow introduction into the actual mystery in the story. From that point on the suspense and the romance both build. Thankfully Irene gives us breaks in the suspense to catch our breath. I received a free copy of this book from the publisher in exchange for my honest opinion. Second book in Men of Valor series! 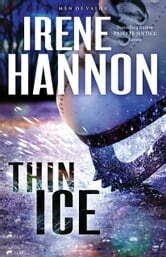 Thin Ice by Irene Hannon is the second book in the Men of Valor series. Christy Reed lives in St. Louis, Missouri and she is the Director of Youth Programs for a municipal recreation program in St Louis County. Christy is going to visit her sister, Ginny (a wildlife biologist). Christy has not been able to reach her and is worried. As she approaches her sister’s house she notices a police officer blocking the road. Her sister’s house in on fire. The fire progresses quickly and no one escaped. Christy had lost her parents just eight months prior in a car accident. Christy no longer has any family left. Two months later Christy receives a letter in her sister’s handwriting. Ginny states that she has been kidnapped. Christy is shocked. Christy calls the FBI and reaches Lance McGregor (a brand new FBI Agent). Christy and Lance will need to work together to locate Ginny. Thin Ice is a good suspense novel, but it was not great. I felt that the author tried to put too much into one book (Lance’s injured brother, another brother and his lady friend, Lance’s guilty conscience over an incident that happened oversees). I only gave you a summary of the main part of the story. And why does every book have to have a romance? Is it really necessary. The one thing that really turned me off in this book was the (kobo made me edit). The descriptions were just awful (and upsetting for an animal lover). I give Thin Ice 4 out of 5 stars. Thin Ice is nicely written and it had a pretty good flow. Thin Ice, though, is a disturbing book (be prepared). I think with a little editing, Thin Ice would be a great book. Though Thin Ice is part of a series, it can be read as a stand-alone (I did not read the first book in the series). I received a complimentary copy of Thin Ice from NetGalley in exchange for an honest review.